Cloud Mining Investments / Daily Profit With Bitcoin HYIP ?! Cloud Mining is one of the most popular Bitcoin investment opportunities available so far. 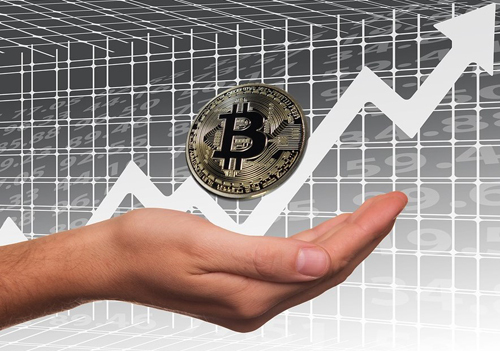 The future might bring a bigger variety of ways to make money with Bitcoin, as investment projects are just at the beginning right now and more engagement in this field has to come up hand in hand with cryptocurrency gaining more popularity and acceptance. The first sort are real mining pools with real hardware, a location like a hall where they are actually mining and they are gaining profits by crypto mining activity. If you invest in those real mining firms, you participate in their profits which they generate by mining. 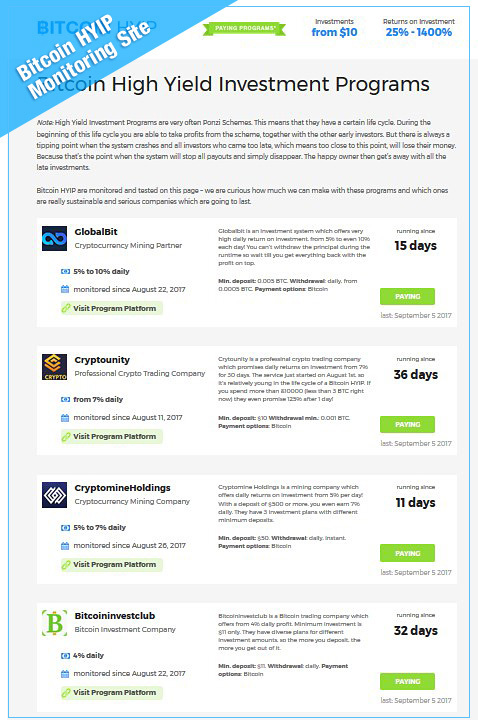 Those actual cloud mining companies can be found in the comparison table on our front page. The second sort of cloud mining companies are firms that only consist of a website and a computer generated investment system in the background. Those investment websites only use the term “crypto mining company” or similar to look serious. Sometimes they also use other terms such as “crypto trading company” or anything else which sounds like a real investment business in the field of cryptocurrency. Those “cloud mining firms” are Ponzi Schemes and investing in them has most likely nothing to do with really investing in cloud mining. So you invest in nothing sustainable but in a scam that just lives as long as people keep investing. There is a certain name for such websites, which is called Bitcoin High Yield Investment Programs (HYIP). Something very obvious which separates those programs from real cloud mining companies, are the extreme high profits they promise, like a couple of percentages daily. Sometimes they even state high hourly profits. The way to make money online at BTC HYIPs is to participate in those projects by making a deposit and let the system payout the promised returns either hourly, daily or after a given runtime which has to end first. Participating is super easy as well as anonymous. You just need to signup with a username, password and e-mail address and make a deposit in Bitcoin – as third step you choose an investment plan with a certain runtime and ROI and the system starts to run. Then you can claim your daily profits by simply withdrawing them from the website to your personal Bitcoin address. Sounds great – or rather to good to be true? Well, of course there is a downside as we mentioned that those programs are scams, or at least turn into scams sooner or later. Let’s explain in detail how those Bitcoin High Yield Investment Programs actually work to find out if enormous gains can be true or not. As already mentioned those HYIP programs most likely don’t have real cloud mining activity in the background. It looks like they only live from the investments users make all the time, which keeps the project running. As soon as there aren’t enough new investors depositing money anymore, the system gets a problem to payout the older investors’ returns. So simply said, each return you get is taken 100% from the deposit of a new investor. This is how classic Ponzi schemes work. So you see that many so-called Bitcoin cloud mining investment companies are scams, especially if they are listed on High yield investment program monitoring websites. Bitcoin High Yield Cloud Mining Investment Scams — Can Somebody Earn High Profits Anyway? So how can you make sure you are amoung those early investors who are more likely going to get their promised profits? Well, as said, the system is fairly easy. Each typical Bitcoin HYIP goes through a certain life cycle. The early investors have the biggest chance to get their returns on investment back together with their pricipal, as long as the system runs. The system only runs as long as there are enough daily new investors making fresh deposits. After a certain amount of time, which can last from a couple of days to even half a year or more, there comes the point when there aren’t enough new investments anymore to payout the older investors. That’s the point when the system stops paying and the site is likely to be offline very soon. So the earlier you get into the system, the more likely you really get that massive profit. So if you take it as a kind of game, and follow some rules, it can be fun and even profitable to participate in those programs. But you have to be aware that they are what they are. And they can stop every day without warning. One of the most important rules is of course never to invest Bitcoins which you can’t afford to lose. So if you are a fan of high yield Bitcoin cloud mining programs because you like this kind of thrill and gambling, then have fun and try your luck as an early investor!